If you are like me..You gobble a mouthful of cookies your Super skinny friend bought from the other side of the world ,only to check the calories and realise you have consumed 600 calories in 5 minutes flat.Well such is life.Thats why this Chickpeas Tahini Salad exists. So they can push your derailed self back on the track.Though its a long long journey to that track..in my case probably 10 kgs.That’s the reason I have been doing a lot of salads lately.Don’t get me wrong…I am doing an equal(or more) number of desserts..So the salad is basically to make space for sugar.I know I know..Extremely unhealthy..but as I said the journey to the track is long and lonely. This Chickpeas Tahini Salad is lots of goodness..The chickpeas or chole as we call them in India, are boiled and then roasted in minimum oil with some salt and chilli.Chickpeas have been around for a long long time in India.Indeed few of our most iconic dishes are using chickpeas.The Chole Poori in the North and the Tam Bhram Sundal-I cant decide which I love more…One stands for decadence and the other is uber progressive salad version of chickpeas. I like how the chickpeas make me full and my body perceives this as a full meal unlike the salads which just have veggies in them. but you could make it yourself too. 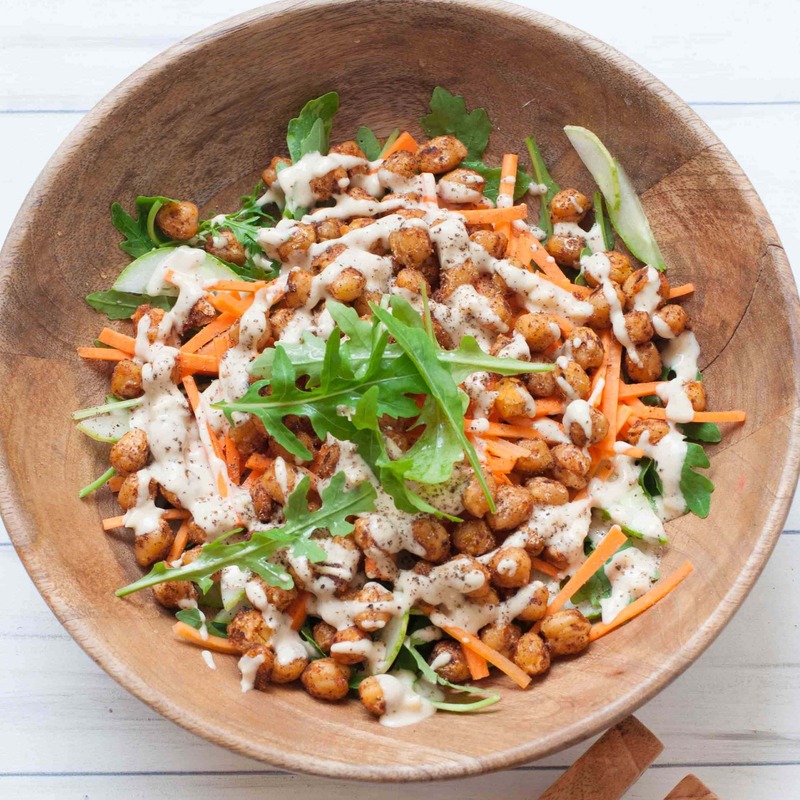 Chickpea Tahini Salad with Pan Roasted Chilli Chickpeas, Carrots,Cucumber and Salad greens with a generous drizzle of homemade Tahini Dressing. if you have dried chickpeas,soak them overnight and pressure cook with 3 cups of water for 20 minutes-till they are tender. Discard the water or the canning saline. Heat oil in a pan on high flame, add the chickpeas and sauce at high flame till you get some caramelisation on the chickpeas.Add Salt and Chilli and mix well.Let them cool. Meanwhile in a bowl layer the salad greens,carrots and cucumbers.Add the chickpeas on top. This salad does well stored in the fridge upto 2-3 days. The Tahini I have used is out of a bottle but you can make it at home too by blending sesame seeds or til in the spice jar.It should have a creamy texture for us to use in the salad.Its almost as easy as making peanut butter at home. Put all the ingredients in a jar or blender.